All rentals include paddle(s) and life jacket(s). 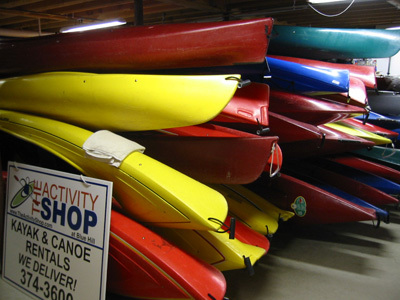 Our fleet of more than 80 kayaks and canoes are manufactured by Old Town Canoe Co. and maintained to the highest standards for a fun, memorable, and safe time. View the different styles of kayaks we have available and to see our recommendations based on your level of kayaking experience. Our rentals are very popular and reservations are highly recommended. When you email or contact us at 207-374-3600 in Blue Hill, let us know where you are staying and if you rented from a property management company. Tell us your date of arrival, when you want your kayak(s) or canoe(s) delivered, and your date of departure. We ensure that your boat and equipment are delivered to your cottage the day that you request. When you leave, all you need to do is make sure that all the equipment is placed inside the kayak or canoe and that everything at an accessible location for pick up. It's that easy! If for any reason you decide to cancel your rental, please contact us by email or by telephone 207-374-3600. Please see your rental agreement for our cancellation policy and requirements.